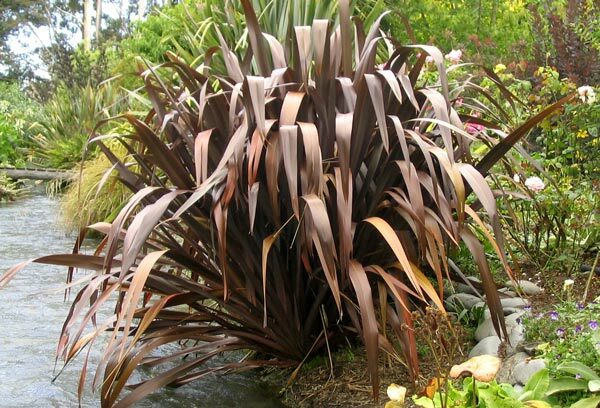 The leaf colour often starts out a rich chocolate brown, with hints of purple and bronze in the sun. These are flaxes too big to be ignored, though I didn't realise when I planted my first ones that they'd be quite that big! 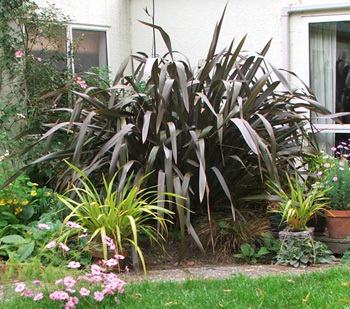 A big browny-bronze flax used to fill the triangular piece of garden by the east side of the house. 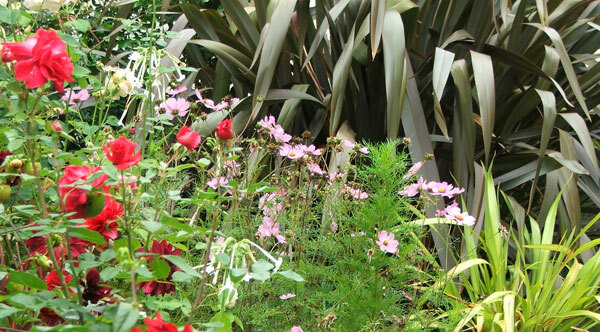 This was under-planted with pink and red leaved Coprosmas and had a huge Mutabilis rose for its next-door neighbour. Some days when I looked at it I was certain I'd made a big mistake - this flax was far too big. After one snowstorm the leaves all collapsed sideways - not a good look! It stayed like this for many weeks. Eventually, I'm sorry to say, it just outgrew this position. Large flaxes planted near house windows - not such a good idea! Another large bronze flax sits like a sentinel in the Pond Border, marking the corner with its huge weeping leaves. It has brilliant dark brown stems covered in black-red flax flowers in summer - the bellbirds can often be found drinking the nectar. This flax was lucky - it had to be scooped out by a digger needing access to the pond. I just dragged it back into the planting hole and stomped around the sides. Whew! No problem. Yet another big bronze flax used to mark the narrow grass gap between the Apple Tree and the Wattle Woods. Finally, after years of indulgence (and complaints from the mower of the Moosey lawns), I had the courage to chop this one down. It was the least colourful of my large weeping bronze flaxes - the colour had turned a rather drab olive-bronze. Mixed in with pretty flower colour, large flaxes look absolutely beautiful. It's just a pity that 'large' changes quickly to 'larger'.